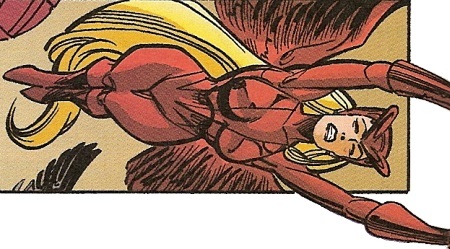 Powers/Abilities: Red Raven has a large pair of wings growing out of her back, making her capable of flight. She presumably has hollow bones. (Marvel Super-Heroes III#8/2 (fb) – BTS) – After being hatched, the daughter of Red Raven spent the next 14 years alone on the Aerie watching video feeds and gathering information on the surface world. She especially watched Namor, the Sub-Mariner, who she considered to be responsible for the death of her father. (Marvel Super-Heroes III#8/2) – Namor’s company, Oracle, Inc., sought to study the sunken Sky-Island (former home of the Bird People) and market the technology for the floating city. However, the workers on the project, including Dr. DeFinkess, were attacked by Diablo, who sought to harness the island’s technology for himself. Red Raven flew there and convinced Namor that Diablo’s intentions were ill. Diablo then alchemically animated the corpses of the Bird People, leaving Namor and Red Raven to fight them off. The corpse of Red Raven’s father attacked her, and she was disturbed by this, but Namor killed the corpse. Diablo departed, exploding Sky-Island as he did. Red Raven chided Namor for his interference with Sky-Island, though she did win a grudging respect for the hero. 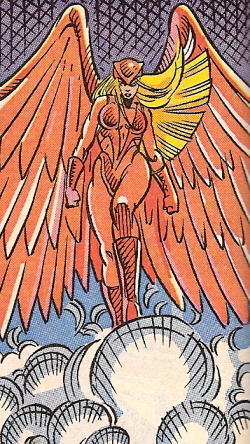 (Nova III#7) - After Nova convinced Red Raven (Dania's father) to leave the Condor to his human captors, Dania returned with the rest of the Bird People to Sky-Island. (Defenders II#6 (fb) - BTS) - Red Raven revived and organized his people into building a new Sky-Island. (Defenders II#6) - Dania and Red Raven were shocked when four Defenders (Doctor Stephen Strange, Hulk (Bruce Banner), Sub-Mariner) appeared suddenly on Sky-Island. Red Raven broke up a fight between Hulk and Bi-Beast, then ordered the Defenders to leave, angered when they stated that a danger lurked on Sky-Island. Three more Defenders appeared (Nighthawk, Valkyrie (Samantha Parrington), Hellcat), angering Red Raven further. After some discussion, Red Raven ordered Dania, Kestrus, and others to search the island for this danger. Dania soon noticed the sigil of the forbidden Bloodraven Cult and noted that they'd built a mystic bomb. The Cult pursued her, but she made it back in time to warn her father and the Defenders, then collapsed from exhaustion. (New Invaders#2 - BTS) – Dania appeared on a monitor with Red Raven, showing their alliance with Thin Man of the New Invaders against the Axis Mundi. (Civil War: Battle Damage Report) - Tony Stark listed Dania as a foreign national, who was active in the United States. Comments: Created by Lobdell, Wozniak, Lopez, and Albrecht. The original Red Raven was a human adopted by the Bird People that eventually became their leader and fought in World War II. The Bird People were revealed to have been an off-shoot of the Inhumans, and had a complicated history of being put in suspended animation and believed dead. Since Dania was "hatched", it is unlikely that her true father is the original Red Raven, since he was a human. Special thanks to Graham Weaver for his help with the Nova issue. 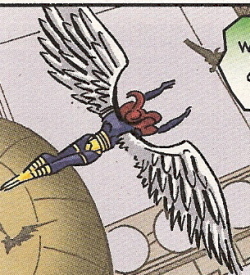 (Defenders II#6) - Kestrus was among the Bird People who searched Sky-Island for the Bloodraven Cult.